Researchers at the University of Lorraine in France say that quasicrystals, a type of complex metal alloy with crystal-like properties, can be useful in the design of new composite materials. Automotive, aerospace and machinery industries, among others, are resorting more and more to the use of 3D printing methods to produce manufacturing components. There is a strong demand that the technologies involved in this process produce parts with stronger functional properties. This requires the development of new adaptable materials. 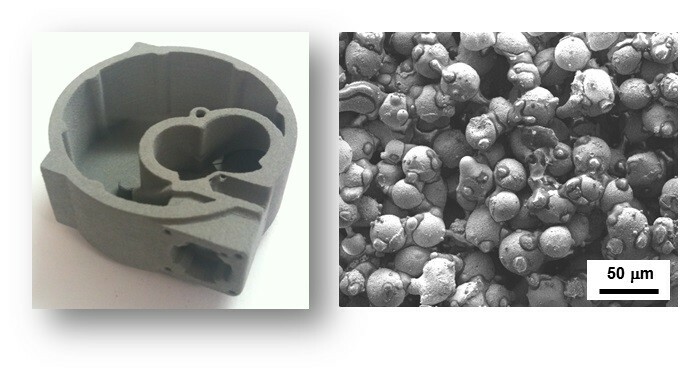 In a review published by Science and Technology of Advanced Materials, Samuel Kenzari and co-authors summarized recent developments related to the use of complex metal alloys in additive manufacturing. "Automotive and aeronautics industries are happy to have functional parts with a lower density," explains one of co-authors, Prof. Fournee Vincent. "Reducing the weight of vehicles reduces fuel consumption." A practical example is shown in figure.